Whether you’re looking for a low growing foundation plant, dense hedge, or unique specimen plant, false cypress (Chamaecyparis pisifera) has a variety to fit your needs. Chances are you’ve seen some of the most common varieties of false cypress in landscapes or gardens and heard them referred to as ‘mops’ or ‘gold mops,’ a common name. For more Japanese false cypress info and some tips on how to grow a false cypress, continue reading. What is a False Cypress? Native to Japan, false cypress is a medium to large evergreen shrub for U.S. zones 4-8 landscapes. In the wild, varieties of false cypress may grow 70 feet tall (21 m.) and 20-30 feet wide (6-9 m.). For the landscape, nurseries tend to only grow dwarf or unique varieties of Chamaecyparis pisifera. The ‘mop’ or thread-leaf cultivars usually have chartreuse to gold colored, pendulous threads of scaly foliage. With a medium growth rate, these false cypress cultivars usually stay dwarf at about 5 feet tall or less. Squarrosa varieties of false cypress may grow to 20 feet and certain cultivars like ‘Boulevard’ are grown specifically for their columnar habit. Squarrosa false cypress trees have upright sprays of fine, sometimes feathery, silver-blue scaly foliage. There are many benefits to growing false cypress trees and shrubs in the landscape. 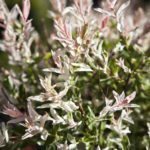 The small thread-leaf varieties add bright evergreen color and unique texture as foundation plantings, borders, hedges and accent plants. They obtained the common name “mops” from their foliage, which bears an appearance to the strings of a mop, and the plant’s overall shaggy, mop-like mounding habit. Topiary and pompom varieties are also available for specimen plants and can be used as a unique bonsai for Zen gardens. Oftentimes, hidden by the pendulous foliage, the bark of false cypress plants has a reddish brown color with an attractive shredded texture. The taller blue-toned Squarrosa varieties of false cypress can be used as specimen plants and privacy hedges. These varieties tend to be slower growing. False cypress plants grow best in full sun but can tolerate light shade. The gold varieties need more sun to develop their color. In cooler climates, they can be prone to winter burn. Winter damage can be trimmed out in spring. Dead foliage may persist on larger false cypress varieties, making it necessary to trim out the plants annually to keep them tidy and healthy. As low maintenance plants, false cypress care is minimal. They grow in most soil types but prefer it to be slightly acidic. Young plants should be watered deeply as needed to develop healthy root systems. Established plants will become more drought and heat tolerant. Evergreen spikes or slow release evergreen fertilizers can be applied in spring. False cypress is rarely bothered by deer or rabbits.